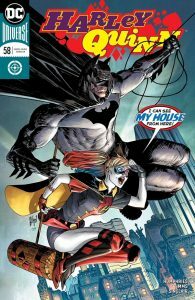 I think this could be one of my favourite issues so far, I love the Batman/Harley team up. 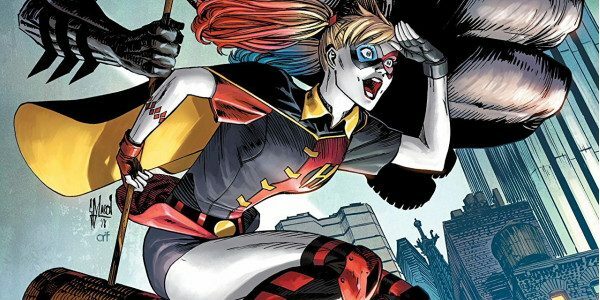 From the off this is brilliant with Harley asking us to keep quiet as Batman doesn’t cope well with breaking the fourth wall and the switch up of styles to show us how she got into the Batcave (and under Bats skin). I love how you can tell the frustration Batman is going through as he tries to keep focused and professional while Harley’s craziness fires off all around him. My favourite bit os the way he cracks straight after telling her he’s not going to the power of Harley Quinn wins again. The balance of these characters just work so well together as she literally drags him off of buildings at a whim and he has to quickly regain control it forces him out of his controlled comfort zone and really gets the best out of him while she is oblivious to the problem and has total faith that he will just deal with it.